Details of our Brownies are available on the Brownie page. Children’s Liturgy runs at St Mary and Monica's during the 9.15am Sunday Mass during term-time only for all ages up to when they begin their preparation for the Sacraments of Reconciliation and First Holy Communion. Children can join the group as soon as they arrive for Mass, in the side room within the church, where they discuss the Gospel in simpler language and also do a focus activity around the theme of the gospel. They then return to the Mass during the offertory. The liturgy group is run by volunteers (all mainly parents of children within the primary school) and are DBS checked. Parents are welcome to attend with small children and this is usually encouraged if they require closer supervision. We are always looking for more volunteers to ensure we have a broad pool of helpers. This then means your turn comes round less often! If you are interested, please contact Rose: or 07460 673919. Here is the current rota for children's liturgy. The current rotas are available for St Mary and St Monica's and Sacred Heart. The Knights of St Columba are an Order of Catholic laymen dedicated to the service of the Church and their fellow man. It is the largest Order for Catholic laymen in the United Kingdom. This is non-political and cares for the needs of young people and anyone with social problems. It contributes to the material needs of the Church and actively supports CAFOD in it's work for under-developed countries. We are currently offering free places at our National Youth Seminar to young Catholics (16 to 22 years old) in our area. It takes place from mid-day Tuesday 16 to mid-day Friday 19 July 2019 at Hinsley Hall, Headingley. Click on National Youth Seminar for more details. Note: numbers are limited! This is the fun and faith-based youth group for ages 13 to 18 year olds. We meet fortnightly on a Friday evening during term time to understand and experience our faith, as well as have some fun and enjoy the evenings. Every other year, we also run the Confirmation preparation for the parish and in May 2012 we had a large group of young people who chose to make the step in their Catholic life to receive the Sacrament of Confirmation. This October (2013), we will be starting the Confirmation preparation for those in Year 9 or above who would like to receive the Sacrament. More details will be available in the bulletin. The NetONE group also go on trips together, such as to the Big Night Out in May, and the Good Will Walk to Ilkley on Good Friday. We are involved in fundraising and we currently sponsor three girls who attend a Christian school in India. Details of our next meeting are in the current parish bulletin and on the parish calendar or you may want to contact the parish. You can also read the Leeds Diocesan Youth Service Newsletter. The main focus of the S.V.P. is gradually changing towards helping the lonely and the sick by visiting and by organising social events. For more details, please click the SVP page or contact Stephen Cook on 01274 495911.
involve the parish in activities to promote the interests of the Third World. TWIG has been in existence in one form or another for over 30 years. 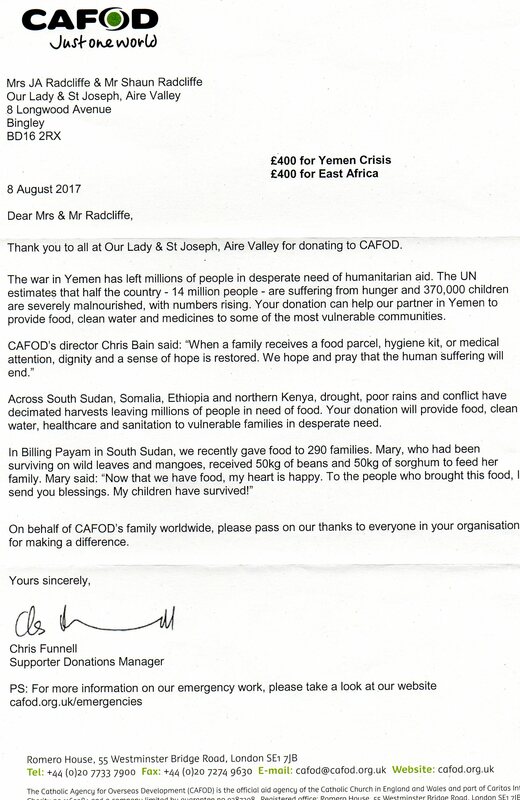 In that time we have donated over £80,000 to many different causes, including CAFOD, Mary’s Meals, Sylvia Wright Trust, natural disasters and many others. 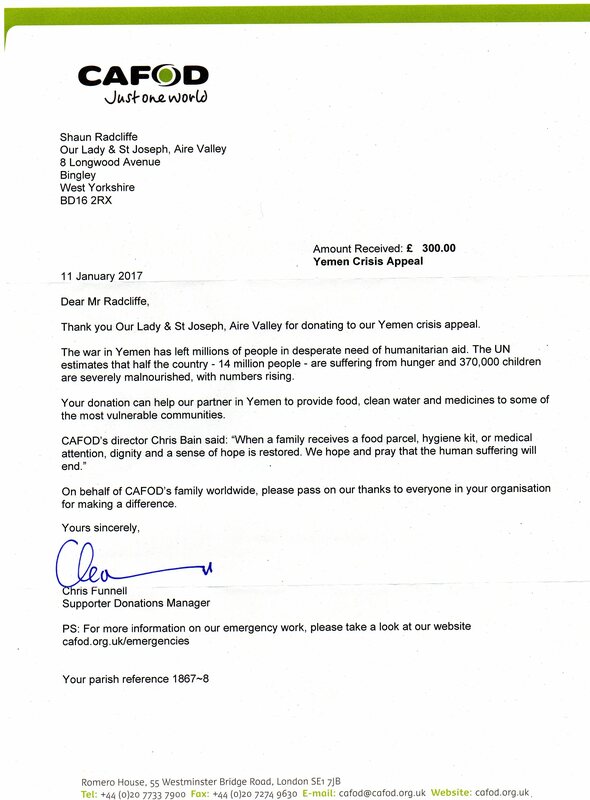 CAFOD has recently sent letters of thanks in August 2017 and in January 2017 for donations we made to the Yemen Crisis Appeal. Regular events are our Traidcraft (NB Link opens in a new window!) stalls and collections during the year. Contact Viv Drake on 01274 771369. The Lenten Project for 2018 was Aid to the Church in Need. The focus for Lent 2017 was 'Let the Children Live', a charity supporting street children in Colombia. The Lenten Project for 2016 was the Sylvia Wright Trust, supporting the excellent work carried out by Sylvia and the charity in providing healthcare and education in India. Minutes of our meetings and recent accounts can be seen on the meetings page. Our details can also be found on the Charity Commission website. Pope Francis has asked us to "Share the journey" with refugees, to walk remembering and praying for refugees. To this end, CAFOD asked us to walk a distance (multiplied by the number of people on the walk) and add these miles into a totaliser. The aim is to walk a total of 24,900 miles - the distance around the world. We took part in this and arranged a walk on 10th June, walking from Bingley Fire Station, Main St, Bingley starting at 11am. Then via 3 Rise Locks and along the canal bank to Roberts Park, Saltaire. Picnic together around the bandstand at about 1pm. The walk is 4.5 miles. The ground is suitable for all manner of people. Trains are handy from Saltaire back to Bingley etc. For more information contact Paul Sullivan on 07824 566442. The Union of Catholic Mothers (UCM) is a national organisation of Catholic women, open to all women whether married or single, Catholic or non Catholic who support our aims and objectives in "prayer, love and active witness to marriage, family and Christian life in the world" (from our membership prayer). The U.C.M. 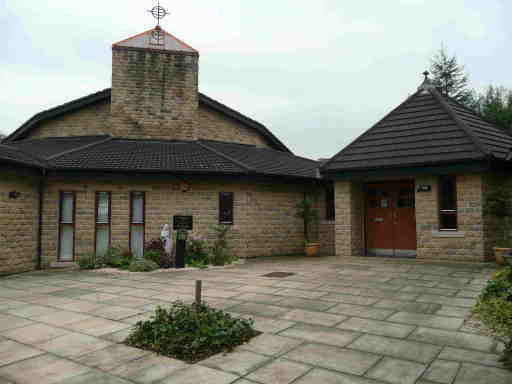 in our parish was enrolled as a Foundation on September 11th 2012 at St Mary and St Monica's church, Cottingley. We would love to have more members: would you like to join us? We meet every other Wednesday, from about 7.30pm to 9.30pm, in St Mary & St Monica church, Cottingley. Dates are on the Parish Calendar. We pray, have fun, invite speakers and have trips out. In May 2017, Helena Harrington gave us an informative talk on the history of the Womens Institute - see THIS PHOTO. There is a annual Pilgrimage to Walsingham in July for all the foundations in England. A Rosary Rally is held annually at St Anne's Cathedral, Leeds for all members of the UCM in the Leeds Diocese followed by refreshments in Wheeler Hall. Our meetings are prayerful and sociable events where we meet up with old friends and make new. We are also looking at ways that we can support Keighley Women's Refuge. For more information, please contact Moira Smith on 01274 822354, Diane Charnock on 01274 569729 or Christine Acomb on 01274 562887. The APF or Association for the Propogation of the Faith is the principal mission support organisation of the Catholic Church. As part of the APF worldwide network, members play a vital role in building up the Church and reaching out to the poorest and most in need. To obtain a red collection box for your home, contact the parish local secretary Kevin King (for Cottingley) on 01274 825600, or Jeremy Charnock (for Bingley) on 01274 569729. Boxes are emptied up to three times a year and members receive a quarterly magazine, Mission Today. Gift Aid - Anyone receiving income over and above the basic state pension is probably paying tax and is therefore entitled to Gift Aid their contributions. Please ask for a Gift Aid form if your circumstances permit, as this is a valuable source of extra income. Boys and girls in Year 4 and upwards may be trained as Altar Servers. For further details, please contact Fr Molloy. Contact Julia Radcliffe, Paddy Spiller or Katy Gaul. See the Parish Rotas page. Faith and Light is a Christian organisation for people with learning difficulties, their parents and friends. 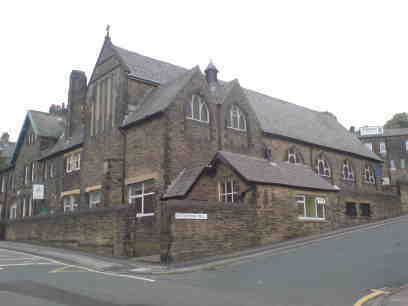 We meet on the second Sunday of each month in the school canteen at St Anne's, Keighley. For further details, please contact Peter Hellens on 01274 567760. Do you pay UK Income Tax at either the standard or higher rate? If so, for every £1 that you give to the church - or any other registered charity - 27 pence can be reclaimed from HM Revenue and Customs at no cost to you if you complete a simple form. The scheme is even more beneficial for higher rate taxpayers. For more details, please contact Tony Hintze on 01274 568908. For the financial year 2007/8, the parish received £10,500 from HMRC due to Gift Aid donations! Why not complete this simple form and return it to Tony or Fr Sean right now? Want to know more about our faith? On the second Sunday of the month (usually), following 9.30am Mass at Cottingley and coffee, there will be a talk and/or discussion on an aspect of our faith. Everyone is welcome to join in and ask questions. The talks so far have covered "How was the Old Testament written? ", "How is the Old Testament relevant to our faith today?" and a presentation on the Turin Shroud. The next talk will be on 9th November and will be a continuation of “How is the Old Testament relevant to our faith today”. Notes from the talks are available at How was the Old Testament written and How is the Old Testament relevant to our faith today.